The Rochdale AFC kit 2013/14 has now arrived and is on sale immediately from the club shop at Spotland. They are priced at £39.99 for Adults and £29.99 for Juniors. 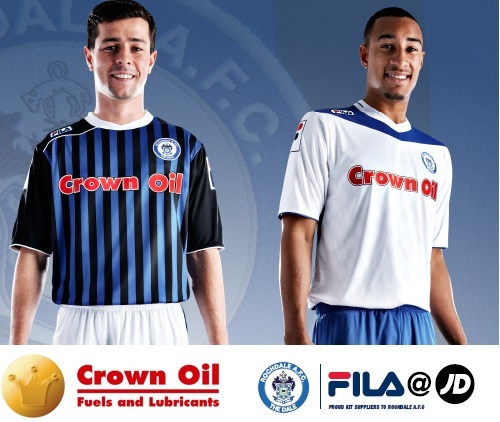 Crown Oil Ltd is proud to be the official sponsor of Rochdale AFC kit 2013/14. The Crown Oil logo will feature as the primary sponsor on both the home and away kits for the forthcoming campaign. As the kits have arrived earlier than expected, they will be worn throughout the whole pre-season programme. Dale start their pre-season away to Northwich Victoria on Tuesday 9th July before travelling to Stalybridge Celtic (16/7), Macclesfield Town (23/7) and Winsford United (29/7). The fixtures also see Lancashire rivals Blackburn Rovers (20/7) and Preston North End (27/7) visit Spotland as the Rochdale players warm up for the 2013/2014 Football League 2 season. The League 2 season begins on the 3rd of August as Dale entertain Hartlepool United at Spotland. The fixture was specially selected by the League as part of its 125 year anniversary celebrations. The match will be the 137th encounter between the two clubs, the most played Football League match between two current members. We wish the team the best of luck for the new season.